I can say that Linux on netbook is gaining momentum right now contrary to what others believe. Just take a look at the growing number of Linux distributions that are optimized for netbooks so that you will know what I mean. Ubuntu Netbook Remix (UNR) is a Canonical-sponsored netbook-optimized Linux distribution that is (of course) based on Ubuntu. It has been available since Ubuntu 8.04 "Hardy Heron". UNR is an optional preinstalled operating system (OS) on some netbooks such as Dell Inspiron Mini 10v and the Toshiba NB100, and also runs on popular models such as the Acer Aspire One and the ASUS Eee PC. Canonical has collaborated with Intel and is working with a number of OEM's to deliver Ubuntu on netbooks in retail. All of the initial Ubuntu Netbook remixes combine optimizations from the Moblin project for Intel Atom processors. 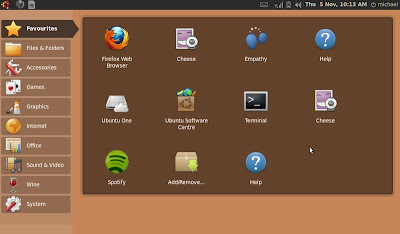 More about Ubuntu Netbook Remix HERE. 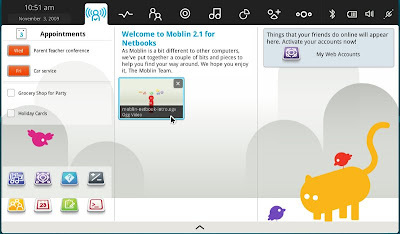 Moblin (Mobile Linux) is built around the Intel Atom processor with current builds designed to minimize boot times and power consumption. The netbook/desktop version of Moblin currently supports other chipsets based on the SSSE3 instruction set, such as the Core2 and some Celeron processors. Products built around Moblin 2 include a Foxconn netbook and an InvenTech smartphone. Acer has also announced the replacement of Linpus Linux with Moblin on their Acer Aspire netbooks. More recently, Dell began accepting orders for its Ubuntu Moblin Remix. Mandriva has started to offer Moblin's v2 version to all Mandriva distribution and netbook owners. 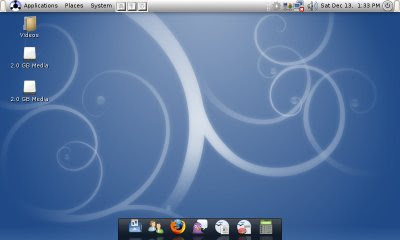 Easypeasy (formerly Ubuntu Eee) is one of the many netbook distros that is based on Ubuntu. It is known to offer proprietary software instead of free and open source software alternatives (e.g. 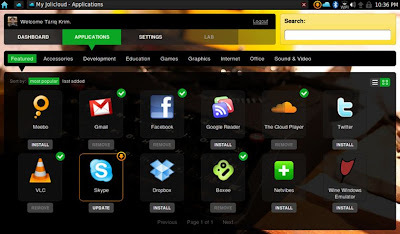 Skype instead of Ekiga) for functionality reasons according to its developers. Easypeasy is specially designed to work well with Asus EeePCs but its most recent versions are known to support other brands of netbooks. Eebuntu is originally made for Asus Eeepc series of netbooks and works out of the box on ASUS Eee PC 700, 701, 900, 900A, 901, 904HD, 1000, 1000H, 1000HA, 1000HD and 1000HE. 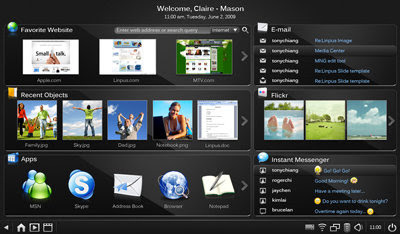 However, other nebooks such as the Samsung NC10, Acer Aspire One, and Dell Mini's are supported but with minor issues. Eeebuntu comes in 4 variations: Standard, NBR, BASE and LXDE. Linux4One is an Ubuntu based Linux distribution that is specifically designed to offer out-of-the-box functionality for the Acer Aspire One series of netbooks. To achieve this, it incorporates a customized Linux and appropriate drivers, as well as a number of tweaks to system files to improve performance. Linux4One comes in two flavors: The "Standard" release that uses the GNOME environment, and the "Lightweight" version that uses LXDE. 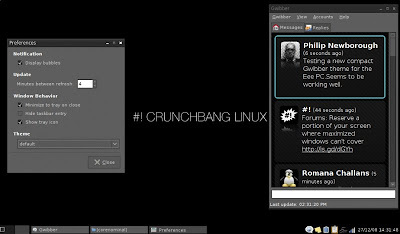 CrunchEee is a special version of CrunchBang Linux that's developed for the Asus Eee PC. 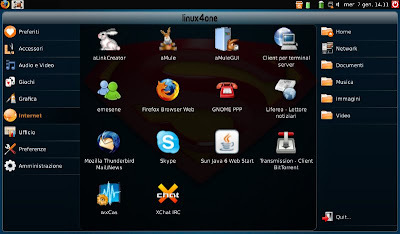 It is quite similar to that "Lite" edition of CrunchBang, but it includes a full suite of Internet applications and an Eee PC specific Linux Kernel and scripts. 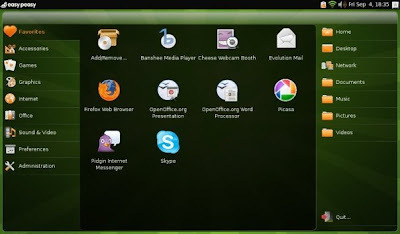 Some of the applications installed by default on Crunchee are Transmission, Firefox, VLC, Pidgin, and many more. 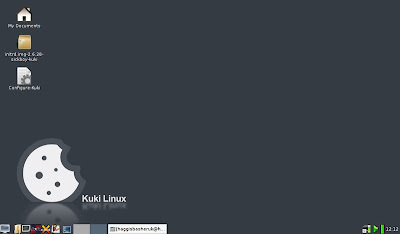 Kuki Linux is a lightweight Ubuntu based distribution that was developed as an alternative for the Fedora based Linpus OS, which was bundled with the Aspire One. Its main goal is to give users the ability to install an operating system that will be fully hardware compatible with the Acer Aspire One out of the box. Kuki Linux uses Xfce as its default desktop environment. Linpus Linux Lite is the faster and slimmer version of Linpus Linux and fully supports Acer Aspire One and Northtec Gecko netbooks. Take note that the Linpus system contains not only the free and open source operating system, but also Acer-specific shareware. The fact that the Acer distribution contains this software that is not available in source code prevents the system from being considered a fully free operating system. Jolicloud (currently in development and alpha testing) is built upon Debian and Ubuntu 9.04. It utilizes Mozilla's Prism Prism-based packages and Canonical's Ubuntu Netbook Remix (UNR) to deliver a Web-centric Linux environment that is very user-friendly. Jolicloud is designed to run on relatively low-powered netbook computers and claimed to support all the major netbook manufacturers such as Asus, Acer, Dell, MSI and Samsung. Though the stable release version of Google Chrome OS will not come out until the second half of 2010, it is showing early signs of someday dominating the netbook market. 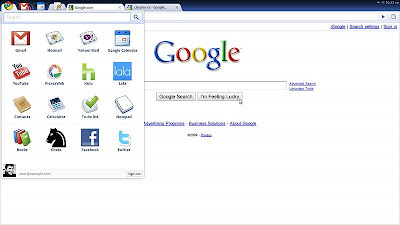 As demonstrated at a November 19, 2009 news conference, Chrome OS closely resembled the Chrome browser, but with tabs for frequently used Web-based applications. You may also like reading our previous post about optimizing GNOME for netbook display. Don't forget mandrivauser.de Netbook Edition..
... and the KDE4 Netbook Version! There are 400+ Desktop Oriented distributions with not much of market share to speak of. I'd prefer 3-4 strong ditributions that actually work instead of dozens/hundreds that don't. you should check out xpud as well.. boots in less than 10 sec on my mini 9 and offers basic all the functionality for day to day work.. Most of these are just Ubuntu clones. It wouldhave been much mopre interesting to list some of the really different ones. Also, for this review to be useful, it needs boot times, speed and ease of operatin etc. I hardly think that Google's Chrome OS is a contender in this space simply because people without internet access will have no use for it other than paper weight. A real netbook distribution would include BTRFS and COMPRESSION support. Small netbooks have small hard disks, so compression is a must (also to enhance performance). Just because some of these Linux distributions are advertised for netbooks, doesn't make them fit. Hi, could I point out that you should refer to the operating system as "GNU/Linux"? By leaving GNU out you're not drawing attention to the GNU OS that the Linux kernel sits on top of. Contrary to others believing that Linux on netbooks is gaining momentum, the only Linux option right now is Dell. All of Asus, HP, Acer, Lenovo, MSI, etc. have stopped offering Linux-based netbooks. And the Dell Linux netbook offerings are only the lowest of the low end ones. I was hoping linux would get a foot in the door with the netbooks, but the big boy is not about to let that happen... Too bad. And another, Pupeee Linux, based on Puppy Linux. "Hi, could I point out that you should refer to the operating system as "GNU/Linux"? By leaving GNU out you're not drawing attention to the GNU OS that the Linux kernel sits on top of." You could, but very few people are listening in my experience. No harm in trying, and by all means keep it up, but I think you've got about as much chance of getting people to say 'Internet search' instead of google, or 'vacuum cleaner' rather than hoover! Ubuntu remix hardly works on my Asus Aspire. I installed via USB flash drive using Unetbootin. I cannot install anything using Synaptic Package Manager. It says "not supported." I might be willing to give that Linpus Lite a try. Also, I heard Debian and Fedora work really well on netbooks. Mandriva (2009.1 and up) works excellent on my ASUS 1000HE netbook. I have a hp mini 1000 that came with the hp/linux os, which I did not like for a number of reasons,the interface was too limiting for me. I didn't really know anything about linux but I decided to try Ubuntu Netbook Remix after reading a little bit. From the first time it booted up I loved it. There was only one issue with wireless but that was solved by hardwiring an internet connection and letting Ubuntu download and install the right drivers. As I have been noticing a lack of interest or in some cases hostility when I try to show off my new operating system I have pondered why it is that I am so exited about my new operating systems while others could care less. ??? Anyone tried Slitaz, that's my next project. I'm getting tired of ubuntu and it's derivatives, just too slow. Opensuse 10.3 was quicker than any ubuntu based distro. SliTaz 3.0 stable has worked well for us for some weeks on our Acer Revo 3610 with Atom 330. It is just a matter of getting used to a new software environment - the TazPkg package manager is simple and effective but differs considerably from (eg) Synaptic. Now using this as main OS on this machine as well as one of our used laptops. So far so good! We like it.